Joel Beinin is the Donald J. McLachlan Professor of History and a professor of Middle East history at Stanford University. His latest book is The Struggle for Worker Rights in Egypt (Solidarity Center) and, co-edited with Frédéric Vairel, Social Movements, Mobilization, and Contestation in the Middle East and North Africa. The Middle East’s Working-Class Revolutions? The success of the insurgent movements throughout the region correlates well with the strength of organized labor. 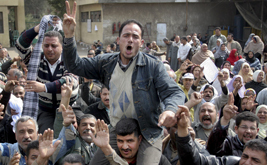 Egyptians’ aspirations to democracy and social justice will depend on workers’ willingness to take to the streets. The longest continuous nonviolent mobilization in Palestinian history is uniting villagers from all political factions, along with Israeli and international activists, against the encroachments of Israel's separation barrier. Two new books explore the Arab-Israeli tragedy: Shlomo Ben-Ami's Scars of War, Wounds of Peace and Gershom Gorenberg's The Accidental Empire.